Diving Labels: A “must have” for divers from amateur to professional. A “must have” for divers from amateur to professional. 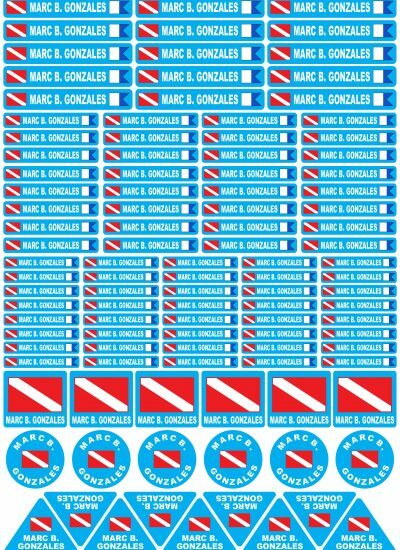 Most diving equipment looks the same, but with our waterproof adhesive diving stickers, you can easily pick out your equipment in a flash while other people on the boat are scrambling to figure out which tank etc is theirs. Made from 3M Brand Reflective sticker material & Ritrama brand vinyl with added lamination to prevent scratching and damage. All stickers are 100% waterproof & machine cut with rounded corners! The difference between our 3M and Ritrama is as follows. The 3M is our most popular material as it is REFLECTIVE. So should you lose a piece of your equipment in murky water, simple torchlight will pick up the 3M label. You can use our very simple design service which allows you to input your name and logo of your choice, or we can create a design for you at NO additional cost. Great for group diving holidays and individuals. Every single order of Dive Labels will come with a FREE Dive Flag Set, perfect for using as car stickers We already have more than 15,000 happy customers as we are the Number 1 Diving Label company worldwide. All my dive gear is now stickered! On recent dive trips I no longer had the anxiety of getting my gear mixed up with anyone else’s on the boat and at least had a possibility of having lost gear returned if that happened. 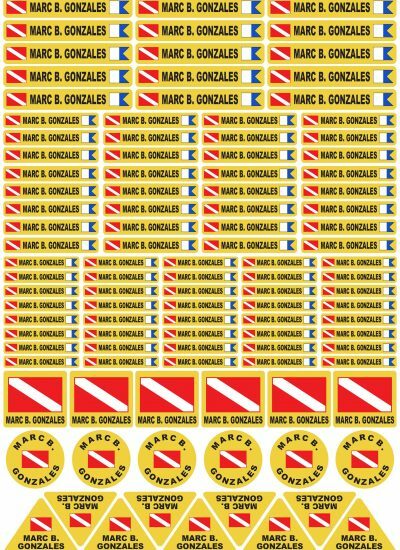 Other divers noticed the stickers and wanted to know where they could get them. I’ve only got 10 dives on the stickers but they look like new and haven’t faded, ripped or detached at all. These stickers are top-notch for all things sailing-related. I’m about to head off on a racing circumnavigation and wanted to make sure my gear was distinguishable from all the rest of the crew’s gear – much of which are identical pieces. 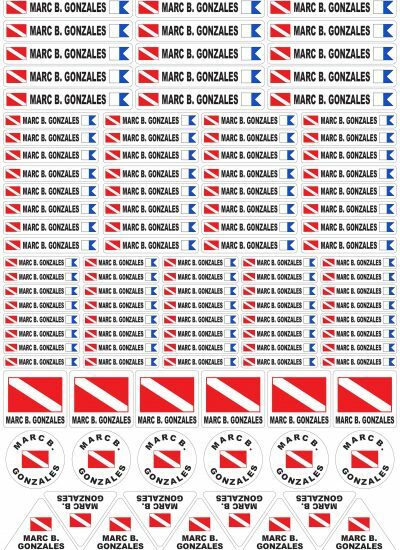 The ability to customize these stickers with my own logo and name make them absolutely essential to any good sailing kit. The seller has great (and fast) communication in getting the product customized and the stickers themselves are high-quality 3M waterproof. You can’t go wrong with these for sailing or any other water sports for that matter. These labels are awesome! We purchased more than 2 years ago and have gone on many dives since (both fresh and salt water), and they have not budged off of any of our scuba equipment. Great for boat dives where there is ample opportunity for gear mix-ups. Highly recommended for any scuba diver!! Love them! 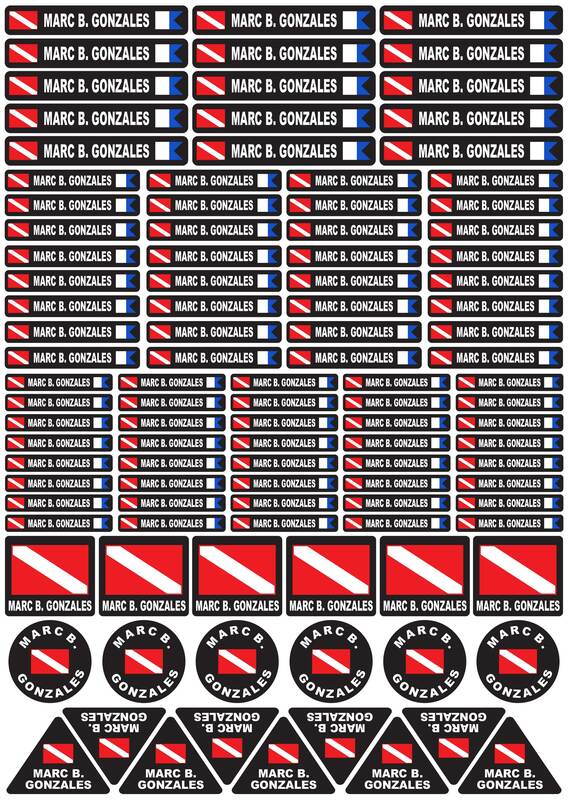 They fit on ALL types of scuba gear because of the varying sizes of stickers. This will help on the crowded boat dives when it seems like everyone’s gear is mixing with mine. My husband is terrible about mixing our stuff together and while some of it is different colors, our masks, gloves and computers are the same. These stickers should be helpful.